Much of the copy on our pages is spent exam-ining the technical and financial sides of our business — the vessels, systems and equip- ment, as well as the companies and individual that design, build and operate them. Harl Brown (44), and Lawrence Glass (65); and the explosion and sinking of a chemical tanker off the coast of Virginia, apparently resulting in the death of 21 — helps to put into perspective our business at hand. Long Island to Manhattan — dodging taxis, buses and the rare crazed bike mes- sengers — on my 20 minute walk to work. Life on the water is another story. The business of building and operating vessels — while arguably safer than ever — requires a high degree of expertise, support, training and education. The investigation of maritime mishaps is a long, laborious and often inexact process, and a reasoning for the above-mentioned accidents is not even close at hand. During a recent meeting of the EU Temporary Committee on Safety at Sea, the delegation was told by Eduardo Chagas of the Maritime Transport Section of the European Transport Worker's Federation that the prime reason for casualties was human rather than structural failure. Combined with the current mandates regarding the security of vessels and port facilities, the need for outside assis- tance to ensure that your company's executives and personnel are properly trained and informed has never been higher. Critical decisions made today in this regard will have long term affect — either positive or negative — on a com- pany's bottom line. Pictured on the cover is MS Ooslerdam, an 82,000- gt, 1,848-passenger ship, built by Fincantieri driven to o speed of 24 knots a pair of 17.4 MW Azipods. Periodicals Postage Rates atWaterbury, CT 06701 and additional mailing offices. All rights reserved. No part of this publication may be repro- duced or transmitted in any form or by any means mechani- cal, photocopying, recording or otherwise without the prior written permission of the publishers. Published 12 times per year, MarineNews is covers the North American inland/offshore shallow draft market. Published four times per year, the definitive guide to marine security systems, products and services. 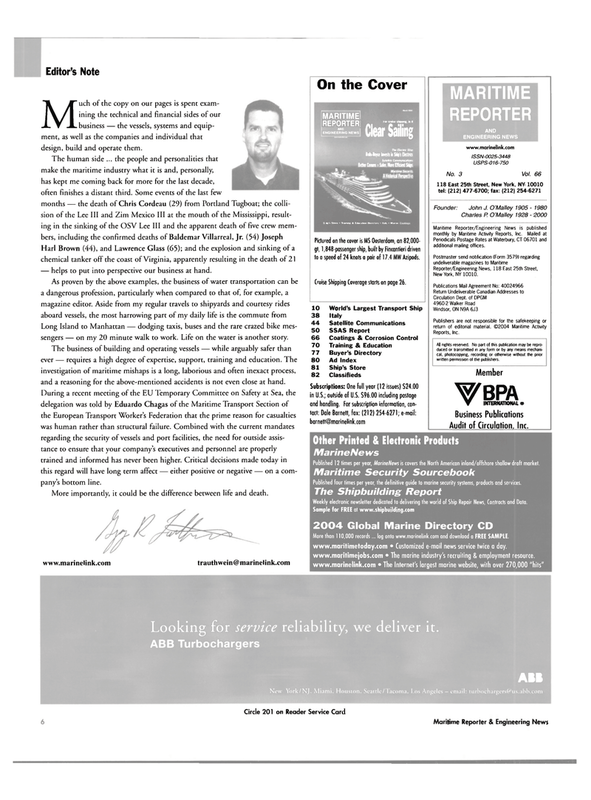 Weekly electronic newsletter dedicated to delivering the world of Ship Repair News, Contracts and Data. More than 110,000 records... log onto www.marinelink.com and download a FREE SAMPLE. www.maritimetoday.com • Customized e-mail news service twice a day. www.maritimejobs.com • The marine industry's recruiting & employment resource. www.marinelink.com • The Internet's largest marine website, with over 270,000 "hits"
Looking for service reliability, we deliver it.